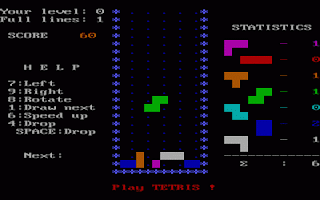 The first DOS Tetris The first MS DOS version of Tetris was implemented a few days after Alexey put together his first prototype of the game for the Electronica 60. All three of us - Dmitry, Alexey, and I - were fans of Pascal and structured programming despite then-recently-published text "Real Programmers Don't Use Pascal". We used various flavors of Pascal to implement our game ideas. Under MS DOS the development system of choice was Borland's Turbo Pascal. I started learning programming with v1.0. In fact, I still enjoy programming in the descendant of Turbo Pascal - Borland Delphi. The last version of Tetris, we worked on together, was compiled with Turbo Pascal 4. That last version of the game had number 3.12. Although 3.12 is pretty much an arbitrary number as we did not have a strict versioning policy. By the way, this version has an Easter Egg. Although not a sophisticated one. I wonder if anyone can discover it. The MS DOS version is quite different from the Electronica 60 draft which initially had just the glass and a score count. That version worked on a monochromatic (green/black) alphanumeric display. The tetramino squares were drawn as a pair of square brackets [ ]. Remarkably, the game was playable and addictive even in that form. This gave us a reason to hurry up with the MS DOS implementation. I believe Alexey expanded his Electronica version of the game after we ported it to the PC to match some of the features we had in our PC games. I never worked with Electronica computers myself. We diligently implemented the MS DOS version of the game in such a way that it could run on any PC we had available. The program ran in a text mode using colored space symbols to represent squares of teraminos. The game could even automatically recognize the IBM monochrome card adjusting the way it drew (printed) on the screen. The clock-frequency race had already started with the introduction of IBM PC AT and PC clones. Many games released for the earlier PC and PC XT (4.77 MHz) models ran too fast on the newer machines. The last version of our game was one of the first to use proper timer delays. 20 years later the same program still runs without any changes, looks and feels the same (especially in the full screen DOS box). Roogoo Roogoo's visuals are cute and the concept is simple, but this fast-paced game of quick reflexes is surprisingly fun and challenging. Ah, falling shapes. They're at the center of some of the best and most addictive games of all time. Roogoo offers up a fresh take on the concept that's extremely simple, but don't let that keep you away. While games don't get much more basic than Roogoo, it still provides a compulsively enjoyable and surprisingly challenging gameplay experience. Roogoo kicks things off with a series of cutscenes that establish the game's story. Apparently the peace-loving, generically cute Roogoo of the planet Roo have always relied on falling meteors that radiate joy to sustain them. One day, King Moo started channeling the power of the meteors into building cities on the lush green planet, but this selfish act turned him and his followers into evil, only slightly less cute Meemoo. Now, as one of the remaining Roogoo, you've got to help the falling meteors reach the planet's core and keep them out of the hands of the king's son, Prince Moo. Or something. Really, it's best not to worry too much about the story. All you really need to know is that this is a game about falling shapes that you have to guide safely through a series of platforms. Although Roogoo may look like a puzzle game at first glance, in fact, it's essentially a very simple game of precision and quick reflexes. You don't have any control over the falling shapes themselves, and you don't use the thumbsticks or the D pad at all. Roogoo is played primarily using the shoulder buttons on the controller. As shapes fall, they must pass through a series of platforms, which conveniently have holes in them that match the various shapes. Your task is to use the shoulder buttons to rotate the platform as the shapes are approaching, so that the falling shapes are lined up with the corresponding holes. If you fail to rotate the platform into the correct position before the shapes hit the platform, they'll get knocked away. If you lose enough shapes, it's game over. That's really all there is to it. It may sound easy, and although it certainly starts out that way, Roogoo actually gets quite challenging as you progress through its 45 single-player levels. Things ultimately get downright ludicrous, requiring robotlike speed and accuracy on the game's default difficulty setting. Thankfully, the casual setting makes things considerably easier, but it's perhaps a bit too easy. A setting that fell somewhere in between the game's two options might have been ideal. While your fundamental objective remains the same throughout, Roogoo does a decent job of keeping things interesting by frequently introducing new elements that make your job a bit more complicated. Initially, there are only three shapes to deal with, but the game soon bumps that up to four and eventually five. 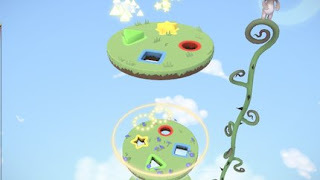 Stacks of shapes also start out falling one at a time, but eventually, they fall in rapid bursts containing many different shapes, forcing you to rapidly rotate the platform back and forth to keep them all. You'll also have to cope with shutters that open and close over the holes, as well as platforms that periodically flip end over end, requiring you to time when your shapes pass through the platform by pressing A to speed up their descent. Additionally, nefarious Meemoo will stand on the platforms. You'll need to bump them off with fast-falling shapes, sometimes in a specific order. Some platforms automatically speed up all shapes that pass through them. Occasionally stacks of falling shapes will have two shades to them, and you'll need to press B to alternate the shades so that like colors are touching when the falling stack lands on a stack you've already set down. All of these elements can make for a great deal to keep track of, and when the action is moving quickly, the game can get positively nerve-wracking. Completing a tough level is really satisfying, and the kind of frustration that results from failing is typically the best sort of frustration a game can cause: the kind that motivates you to try again because you know that, while difficult, the game wasn't unfair. You simply screwed up one too many times. At least, that's usually the case. There are times where the game doesn't provide you with the best view of the action, making things unfairly difficult. Sometimes the camera is simply positioned too far away from a platform, making it hard to tell if you have the falling shapes lined up with the corresponding hole or not. At other times, your view of the holes on a given platform is obscured by stacks of shapes you've already set down. Still, for the most part, the visual presentation in Roogoo, while very simple, is bright and clear. Each shape also has its own vivid color, which can help you identify them when things are moving quickly. You probably won't spend much time looking at the various backgrounds, but they have a clean, cheery style to them that fits the game well. The music in the game mostly consists of light, upbeat electronic tracks that make for a good accompaniment to the action. The relatively few sound effects there are, such as the mewling of Roogoo and Meemoo, also go hand-in-hand with the game's cute, colorful visuals. The single-player game has 45 levels, which offer plenty of challenge on the default difficulty, but those players who opt for the easier setting will probably breeze through them quickly. Going for each level's par time, which is typically very difficult to achieve, will provide added longevity for those who really want to master Roogoo. There are also a few multiplayer options available. 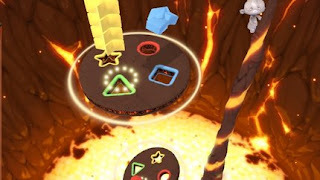 Online multiplayer offers a one-on-one competition that plays out exactly like the single-player game, except that each player also has a power meter, which fills up as shapes are guided safely through the platforms. When the meter is full, pressing Y sends some evil Meemoo to stand on your opponent's platform. The game works really well for this kind of competitive face-off, but unfortunately, very few people are playing Roogoo online, so unless you've got a friend on Xbox Live to play with you, finding an opponent may be difficult. Roogoo also has local multiplayer, which, in addition to the competitive mode, offers a pretty fun cooperative party mode in which control of the platforms alternates quickly among up to four players. Roogoo demonstrates that a very simple game doesn't have to be a shallow game. In fact, Roogoo's simplicity is something of an asset, making the gameplay accessible to just about anyone but requiring tremendous skill to master. While 800 points is perhaps a tad steep for such a fundamentally simple game, Roogoo's fast-paced, challenging twist on the old falling-shapes concept is absolutely worth a look. Tetris 5000 The EleFun Multimedia Company has released Tetris 5000 - a remake of the most famous game in the world Tetris. The game has many advantages and is really worth playing. 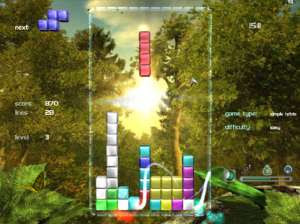 It has perfect and fascinating gameplay of a classical Tetris, as well as many other unique features. Millions of Tetris fans will experience well known feelings, which will be added to the delight from new features and know-how of Tetris 5000. Tetris 5000 broadens gameplay of a classical Tetris. Frames of a game field of this game became interactive and now they are moving from side to side. Bonuses of Tetris 5000 make the game original. For example, bonus “rubber bomb”. It appears suddenly, and its damage radius is great. Sometimes a huge irregular-shaped figure appears in the game. Try to put it in such a way not to lose the round! Visualization in Tetris 5000 is worth to be highly estimated. The game is full of different colours and hues. They possess positive energy and do not make disharmony. Destruction of the whole rows in Tetris 5000 is animated in detail. Two caudate comets are fluttering along the edges of the game field. The moment you put together the whole row or several rows, the comets rush into the game field and whole rows disappear in blazing enchanting flashes. 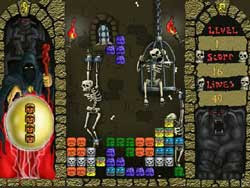 The main peculiarities of Tetris 5000 are animated themes, which play a role of a game background. These themes are made on the basis of animated screensavers of the EleFun Multimedia Company. You will be able to choose the background of Tetris 5000 and have new and unforgettable impressions at each run of the game. Snake Tetris Snake game and Tetris game combine to form this brand new game! Come and challenge yourself with this new tetris game! Also included are snake game and tetris game, so you get 3 games from 1 download! Snake Tetris is a creative tetris game in which the falling blocks are not rigid bodies, but movable snakes. You can control the snakes to go through small holes to fill up the gaps. When an entire row is filled, that row will be destroyed. Sounds easy? No way, obstacles will be formed to block your way, so you must move the snakes dexterously in order to win! RotoBlox RotoBlox is a mixed collection of classic and newest tetris games. Play your favorit games, and try new game types of this highly addictive arcade. The game has different skins. Sink in a jungle world, distant galaxy or construction plant. Download RotoBlox and play any of these magnificent tetris games. The game is a nice gift for a real tetris maniacs! 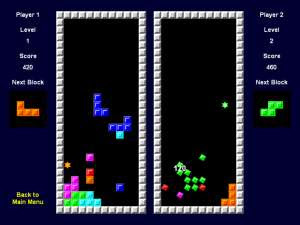 As in the classic tetris, the goal is to use different falling shapes to create complete horizontal lines without gaps. Becoming complete, lines are removed from the gamefield and bring you the score. The more lines you clear, the higher your score is. I also exchange link with you !